The following article originally appeared on November 29, 2014 in the ‘In The Voices for Justice’ blog by Ignatian Solidarity Network. It can be found at http://ignatiansolidarity.net/blog/2014/11/29/jesuit-volunteer-reflects-advent-called-to-something-simple/. Many thanks to Jenn Svetlik from JVC for her support and efforts in the process. Advent: the ambiguous liturgical season that calls us into hopeful waiting for the birth of Christ. As a volunteer who identifies as Catholic, I can easily admit that Advent is often spent waiting for things other than Christ appearing in a manger, such as the arrival and departure of Jesuit Volunteers, the town’s anniversary, the end of the school year, birthdays, loved ones visiting, and Christmas masses galore. For this reason, I often struggle in honoring that call to Advent while being attentive to the pandemonium of everything else. I arrived last December to the intense orientation of becoming a JV in a drastically different culture. 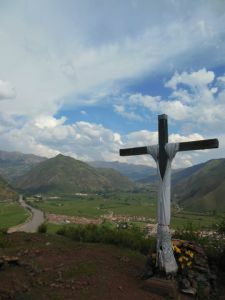 This baptism by fire demanded that I ground myself in the unfamiliar soil of the Andes. I found this challenging, considering that it coincided with the Christmas season, which I normally associate to Santa Claus and Coca Cola polar bear commercials with the spirit of the season. Without the blatant advertising of Christmas, it felt as if December was just another month. During this period, I was introduced to my new JVC family and the Andahuaylillan community. The time became an intensive orientation to not only my new life, but how to findthe “spirit of Christmas” outside of TBS’s marathon of The Christmas Story. 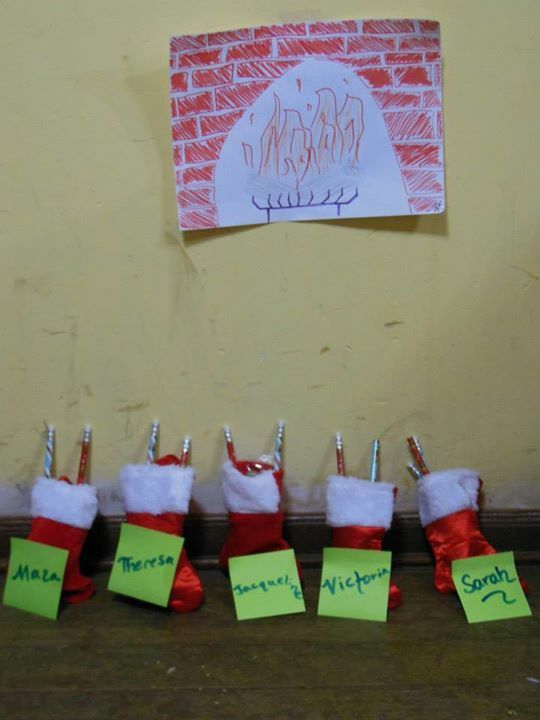 How we celebrated Christmas in the Mountain House last year! An introductory moment of this was in a rural community mass. Located four hours away from Andahuaylillas by foot, Churubamba is a primarily Quechua speaking community. The other JV who had recently arrived and I were asked to accompany the pastoral team celebrate a Christmas mass in Quechua. I felt uncomfortable and awkward in the Quechua, leading me to doubt that I should be there. After mass finished, we helped pass out sweet breads and hot chocolate to those who had attended the service. An older woman approached me, making me nervous knowing that I did not speak Quechua and she most likely did not speak Spanish. She tried to hand me a bag of baked fava beans, a common snack here. Not understanding her intentions or what to say, I pushed them away. The woman continued to stand in front of me with her gentle presence, waiting for me to accept her offering of thankfulness. My friend laughed at me in my gawkiness, explaining that the woman was trying to gift them to me to express her gratitude for coming. I took the bag clumsily, gesturing my mutual gratefulness. I felt awkward, recognizing this was the Christmas spirit of generosity and not having any idea how to be present to it. Last Christmas brought perspective, providing me with a crash course to my JV experience. It asked me to be present to it all—the awkwardness of something new, the season, the budding relationships. As I enter Advent with a year of JVC under my belt, I understand that Christmas and Advent calls me into something simple: time spent with those I love, those I call my community. It invites me into what simplicity has meant for me this year, an attentive presence. While I recognize the apparent chaos of it all, I ask for the grace to be present instead of pulled. I remember that while I wait for Christ, I still must arrive to meet him in the manger taking one step ata time with the person by my side. Only in this way will I arrive ready to celebrate the life of God that must recognized in each other. 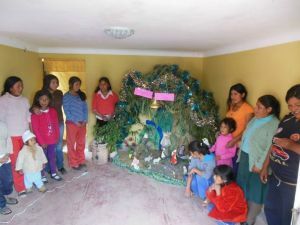 A manger in one of the local communities!